UnderCover makes every PARTY an unforgettable Event with their dynamic, fun, energetic and high-impact Show that is guaranteed to keep the dance-floor packed all night long! This incredible mix of ultra-talented musicians and entertainers from 5 to 15 pieces (you customize it yourself!) are absolutely unparalleled in their stage experience they bring to your Wedding, Party or Corporate Event. 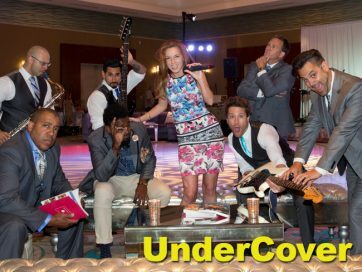 UnderCover specializes in the most well known and often requested high energy dance music of every genre – Pop, Rock, Soul, Funk. Latin, R&B, Top 40 and of course they make sure to especially include all of your favorite music choices from the 50’s to the most current present-day Pop Hits!